We’ve written, edited, and republished our favorite chicken books. Our theme? Practical knowledge and techniques used by old-time farmers. Our first foray into the chicken-book field was Success With Baby Chicks. 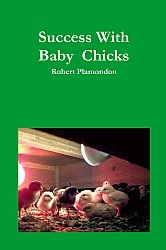 Robert Plamondon wrote this book after realizing that people like you are having heartbreaking failures with baby chicks; problems we learned how to deal with by trial and error and extensive reading. Like us, you can have success every time! 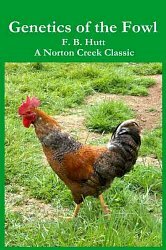 The book has received warm praise from farmers who tell us that it has made a big difference with their chick rearing and many favorable reviews on Amazon.com. 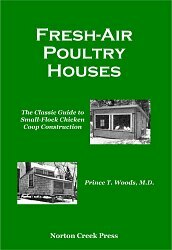 Our most popular poultry book is Fresh-Air Poultry Houses by Dr. Prince T. Woods. Keep your chickens healthy year-round! This book is the bible of the open-front poultry movement, an idea so old it’s new again. Most chicken coops are inadequately ventilated, making them dark, dank and smelly. Chickens, like miners’ canaries, are tough in most ways, but have weak lungs. They can take a lot of cold, but get sick if the air quality is poor! This 1924 book is a great classic, well worth reading. 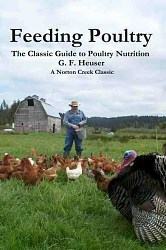 Poultry Production, 9th Edition by Leslie E. Card. Turkey Management, 6th Edition by Marsden & Martin. It is impossible to praise these books too highly. The Dollar Hen had more influence on us than any other chicken book. It set us on the path to successful and profitable free-range egg farming. 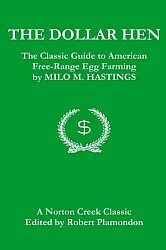 Written 100 years ago by Milo Hastings, a pioneering poultry scientist, science-fiction author, and health-food advocate, it covers how the poultry industry of the day actually worked, and what successful farmers actually did, rather than the trendier money-losing techniques advocated by the poultry press of the day. While quite old, it has many practical concepts and techniques that are still useful today. Genetics of the Fowl taught us a great deal about poultry breeding—enough that we are often mistaken for experts. At the very least, it gave us a healthy respect for the difficulties of poultry breeding, while making us far better at choosing appropriate commercial lines. Feeding Poultry is the best book we’ve found on practical poultry nutrition—accessible enough to be read by the practical farmer, but detailed enough to be used by professionals at universities and major poultry companies. All these books recognize the value of folks with small operations; they were written before factory-farming took hold.